Born Juan de Yepes, John claimed that the Blessed Mother saved him from drowning on two occasions. He received the basis of his religious instruction from the Jesuits. 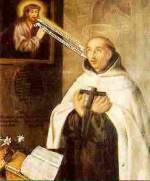 In 1563 he joined the Carmelites at Medina where he was later ordained a priest. Saint Theresa of Avila recruited John of the Cross to help her restore the conservative values and ways of the Carmelite order. Undertaking this mission, John met much resistance from the order. On December 3, 1577, he was kidnapped and sent to prison, where he remained for nine months. The Carmelite Order split inot the Discalced Carmelites and the Calced Carmelites. The pontiff supported the later, and with John's support leading them in several offices, helped attain Saint Theresa's vision. He wrote several papers on mystical theology, including "The Ascent of Mount Carmel", the "Dark Night of the Soul", and "The Spiritual Canticle".